Due to TSA regulations, it is mandatory that you submit your passport information in your Birthright Israel application & upload a copy of your passport. Make sure that your passport is valid through February 2020 for all summer 2019 experiences. If you do not have a passport or it will soon expire, you should apply for one ASAP. Information can be found here. If you are a US citizen, you do not need a visa to travel. If you are not a US citizen, you will need to apply for a visa at the Israeli consulate that serves your area. You can find a list of consulates on the Israeli Embassy website. Please note: if your passport is not submitted in your Birthright Israel application, your acceptance is still tentative. We will be unable to issue you a ticket to Israel without the necessary passport information. If you do not have your passport within two months before your scheduled departure, you may be removed from the program at your own expense. Birthright Israel Application: Go to the Birthright Israel website & login. Go to step 5 of your application to enter your passport information & photo. Please note that your passport number is located on the upper right hand corner of the page with your picture on it. It is a nine digit number. Click "save section." You must confirm in your application status page that your medical insurance covers you for emergencies abroad. If you do not have medical insurance that covers you in Israel, please purchase insurance here. A good option for additional insurance is from the Israeli insurere, CTAS. To order &/or get more information, visit their website. In Israel, constant hydration & protection from the sun is a top priority. Because of this, a canteen/water bottle, hat, & sunscreen are ABSOLUTELY necessary! You want to be comfortable: make sure to bring close-toed shoes for hikes & shoes that are comfortable to walk in, as you will be on your feet! Because you will be loading your luggage on & off of the bus/responsible for maneuvering your baggage at the airports, it is essential to pack in something you are comfortable carrying, meaning trying your best to not overpack. Baggage limits are usually 50 pounds or under, so we recommend bringing a suitcase or duffel on wheels. Additionally, it is a good idea to pack a backpack to carry around your belongings. We also recommend bringing a small cross-body or fanny pack for activities where you do not want to carry your backpack. We require everyone to drink three liters of water a day, as the sun is much hotter in Israel than North America. Camelbak packs come highly recommended by alumni & staff. Although Israel is a generally a very casual country when it comes to dress-code, it is important to have the appropriate attire for religious sites. On days when we are visiting to Old City in Jerusalem or the holy city of Tzfat, your shoulders & knees will need to be covered. We recommend pants, cropped pants, maxi skirts, or dresses. On Shabbat, please dress a little fancier than usual. We recommend casual skirts, dresses, maxis, & polos or button down shirts with khakis or jeans as a fitting option. For more packing tips, check out Pinterest Board. Israel is hot during the summer! Temperatures range from the low 60s to more than 100 degrees, depending on your location. We recommend clothing for a warm climate, with some layers for cooler nights in the desert. Check out our recommended summer packing list. Israel is temperate in the winter with averages ranging from the low 40s to high 70s, depending on location. We recommend packing layers to accommodate these temperature changes. Check out our recommended winter packing list. Participants generally bring between $300 - $400 spending money. You should not change money in advance, as it is more expensive to do so in the US. The conversion rate right now is about 3.4 Shekels to the Dollar. We strongly recommend that each participant traveling on Birthright Israel with Shorashim has a phone with both data & calling capabilities. Shorashim works with 019Mobile to make it as easy as possible for participants to have access to data, texting, & unlimited phone plans while in Israel. This makes it simple to keep in touch with friends & family at home, use the internet, & chat with those in your group. Best part? Each plan is HIGHLY discounted & customized for Shorashim! Why should I get a phone plan for my Birthright Israel trip with Shorashim? 019Mobile phone plans are created specifically for Birthright Israel participants with Shorashim. These plans are budget-friendly & help you stay connected in whatever way makes sense for you. From internet & data to calling, texting, & everything in between, there is a plan for you! Can I bring my US phone with me? Yes! 019Mobile makes it so easy for you by sending you a SIM card prior to your trip. Just make sure your phone is unlocked. You can put in your 019Mobile SIM card while in Israel & then upon your return to the US, you will be able to put your original SIM card into your device. Contact your cellular provider! If for some reason they are unable to unlock your phone, do not worry. You can still order a phone through 019Mobile. I am going to get an international phone plan through my wireless service provider. Is that okay? Shorashim works with 019Mobile to make it as easy as possible for you to stay in touch with your friends/family while in Israel and access internet at your convenience. We highly recommend activating a SIM card for data service and/or local cell phone service in Israel through 019Mobile Although you are able to use your wireless service provider, please keep in mind that 019Mobile has support on the ground in Israel & is your most cost effective option. To make it happen, please visit Shorashim's 019Mobile page We look forward to helping you keep in touch in Israel! You need to meet your group at the ticket counter at least four hours before your flight. Please note that in your Shorashim Application, your flight table will outline the airport that you are departing from & the airport that you are returning to following your experience. It is your responsibility as a Birthright Israel participant with Shorashim to get to the departure airport on the date & time of your flight. You will meet your staff members who will be flying with you to Israel & they will assist you in checking in under the group ticket and going through airport security. All airlines allow one checked bag, a carry-on, & a small bag at no additional charge. You should not bring more than this, as this is what your bus will be able to accommodate. For specific dimensions questions pertaining to a specific airline, please visit their website. Some flights are nonstop, but some flights do require a layover. If you are departing from JFK & want to consider flying into La Guardia as a more cost-effective option, there are various options to assist you in traveling between airports. All meals on the flight & in Israel will be kosher. If you require special meals on the flight and in Israel, please review your medical information on your application status page, & adjust your dietary restrictions as necessary at least two months before departure. Please note that if you are on an airline other than EL AL special meals on the plane will not be kosher. Any seating requests must be made at the airport on the date of departure as Shorashim & Birthright Israel do not have any control over seating arrangements on your group ticket. You must fly with your group from the departing US airport. Under no circumstances can you meet the group in Israel. Passports must be valid six months from your date of departure & you must have your passport with you to travel. If you want to cancel your return flight all together, please email us at registration@shorashim.org with the subject: "Your Name - Cancel Return Flight." You must email us at least 10 days prior to your departure. If you fail to cancel your return ticket, this will result in the loss of your deposit. There are two amazing ways for you to extend your Birthright Israel experience! Want to extend your stay in Israel? Check out BirthrightIsraelPlus.com. This 4-7 day Birthright Israel Plus extension opportunity, focuses on your particular passions (no prior knowledge or experience necessary). This experience allows you to have get an in-depth understanding of Israeli society & culture, while meeting participants from around the world. If you register for Birthright Israel +, the program fee covers the cost of flight extension, accommodations, & most meals for those four or five program days, so you won’t need to pay for your extension flight! Additionally, for this season, Birthright Israel will allow participants to use their deposit towards the payment of the program fee. Birthright Israel Plus allows you to join a new experience focusing on a particular area of interest (no prior knowledge or experience needed! ), following your Birthright Israel trip. BRI Plus programs are 4-7 days long, with smaller groups & slightly more relaxed schedules. 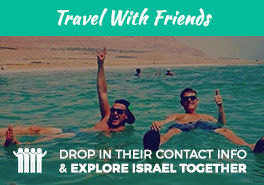 You’ll have the opportunity to meet and connect with participants from different Birthright Israel groups from around the world! This summer, sessions are offered May 26th, June 2nd, June 10th, June 30th, July 14th, July 21st, August 4th, and August 21st. Please note that Shorashim is not responsible for Birthright Israel + recruitment or programming. For additional information, please reach out to info@birthrightisraelplus.com. Whether you are interested in staying in Israel after your trip or exploring other countries, extending your Birthright Israel experience is a great option! We recommend beginning the process as soon as you have confirmed your travel dates & your acceptance is no longer conidtional. Click on the link that says "Gil Travel" under "Order Trip Extension"
Choose your top three date choices for extension. Gil Travel will then be in touch with the proposed cost & next steps. Please note that Shorashim staff are not responsible for assisting with extensions as it is all completed through Gil Travel. It is recommended to apply for a trip extension at least a month before your departure, as changing your ticket while in Israel may prove difficult & more costly when in Israel. Each airline charges different fees to extend flights, & although fees are subject to change, which is outlined here. You must fly home to the gateway airport from which you departed. It is not an option to pay for a layover in another city or change your return flight destination. If you decide to stay in Israel for longer than the airline allows, you will be responsible for purchasing your return flight. For additional information & specific airline policies, please visit Gil Travel. Conditional Acceptances: Please note that your acceptance will be conditional upon receiving your initial offer. You will receive an email once your trip placement is no longer conditional. Joining Your Facebook Group: You will receive an email from us to join your Facebook group. Once you receive this, please make sure to join, as your staff & Shorashim will be sharing important information through this platform. This link will also appear in your Shorashim Application page. Acccessing Your Itinerary: Your itinerary will be available two weeks prior to departure in your Shorashim Application page. You will receive an email, so make sure to add info@shorashim.org. This will also be posted in your Facebook group. Notify Debit/Credit Card Company: Make sure your bank knows of your travel plans. Be sure to check with them about any international fees. With this in mind, we recommend taking out at least $300 in cash to bring with you. Please note that some stops along your journey will be "cash-only", so it is important to have cash. Our Pinterest boards offer helpful pre-trip resources. Make sure to also connect with our Shorashim LinkedIn company page & join our Shorashim LinkedIn group to expand your network, & see how your Shorashim experience can enrich your resume and professional development, & for other helpful professional resources. If you wish to cancel from your trip assignment in time to receive your deposit refund, you need to notify us before the deposit refund deadline, which is 65 days prior to departure. Cancellations made after the deposit deadline will result in a forfeited deposit.